Released in December 2000, Razor Freestyle Scooter (licensed by Razor, which makes scooters) is about a group of kids whose friends have been captured by an evil giant robot. Beating level objectives will unlock special levels where they can rescue their friends. Players can do lots of tricks which may resemble Tony Hawk games but with a better story. Somewhat. Best time: Single-segment 0:11:59 by Dan 'DanE' Söderhäll on 2014-08-06. 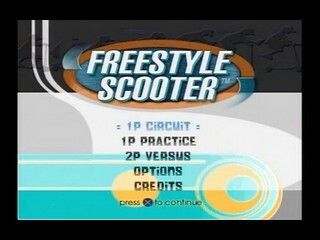 Razor Freestyle Scooter was unleashed upon mankind in the fall of 2000, but the first time this game came to my knowledge was this year. From what I saw it looked like a really, really bad game; thus perfect for speedrunning. This run started out as a joke more or really but I quickly became much more involved with it than what I had planned for and eventually ended up with the run you're watching now. I'm playing the PAL version which excludes the "Razor"-prefix the NTSC version has, but otherwise it's the same game as far as my knowledge goes. Collecting the wheels is just about finding a good route that is as fast as possible. The distance grind is not hard to execute either, since linking tricks in a grind combo is the best way to score points. Earning 100 bonus seconds is a little more tricky, since you need to fill up a meter to the right of the screen to gain these seconds. After you score enough points to fill the meter, you will gain 10 bonus seconds an the meter will drop back to zero again. You are required to fill the meter a total of 10 times to complete the goal and it's very important to avoid bails while doing this. Bails will cause the meter to drop to zero in an instant and if this happens your previous efforts are good for nothing (although the bonus seconds you've already collected are safe). 1. Trick Animation glitch. If you're performing a trick while bumping gently into a wall, the trick animation will end abruptly. In this case you can, for instance, land backflips on the ground by performing the trick while slamming into a wall, which would be impossible otherwise unless you jump from a QP or a height. Backflips, or just about any other "special moves", will grant you up to 2000 points and this can provide you with those extra points you need to gain bonus seconds while travelling through areas that are empty. This technique is used one time ín Level 2, Schoolz Out. 2. Speed boosts. If you scoot over an edge of a quarterpipe or bowl at an precise angle, you will receive a large speed boost. Speed boosts are widely used throughout the run. I'm quite satisfied with the route on this one and it was the first level I good a good grip on. I had some problems aligning properly on the kicker that sends you straight trough the sign and onto the rails behind it, which is why I had to slow down a little just before making the jump. The controls are not accurate at all which makes it hard to place these kind of jumps. The jump to the curved rail in the end of the level is also rather delicate, but overall this is a good first effort. The first area is perfect for racking up big points and before heading for the bowl in the upper right corner of the level I earn 80 bonus seconds. Originally I had 60 bonus seconds dropping in to the bowl, but it turned out that it was easier and faster to fill the meter two more times before hitting the bowl. The jump from the bowl area to the tennis court is very hard to do while going at full speed and this specific area caused a lot of resets. I angled slightly off to the right on the very last jump on the level and had to go back which cost me about 2 seconds but otherwise everything is pretty solid here for the most part. A very straight-forward level with room for some creativity. The bowl in this level is much smaller and better suited for performing tricks in than the one in Schoolz Out. I thought I needed more points to complete the final Bonus Time objective and was quite surprised when I got it on the last jump. The intention here was to launch up in the air from the ramp in front of me, but luckily I managed to stop on the edge of the ramp to avoid losing more time. You can take all 4 jumps in any order you like, but in order to make it as easy as possible to collect the last wheel – which is located on the curved rail – the last jump should be right in front of it. The limited speed you get approaching this rail is not enough to guarentee a safe return, which is why it's easier and faster to just bail right after you collect it and wait for the character to respawn at the top of the level. After completing the level, the screen goes black for a while before the Menu theme starts playing against a black background. What you don't get to see here is a picture displaying the character that you have saved by completing the level (these unlocked charachters are playable if you return to the main menu also). It's quite tricky to skip this picture since you have to press and hold the X button at a specific point, but it saves about one second per level and well worth it. Exactly the same as SF1, only this time we have collapsing floor pieces to deal with. Gap three times, build up speed and jump for the long rail where (mostly) all wheels reside. Easy enough, just make sure that you don't overshoot a wheel or two at the top of the rail. The curved rail that stretches through what seems to be a couple of goggles is hard to reach coming straight from the high rail that connects the two quarterpipes. I barely got enough speed to reach it here and I can't stress how important it is to reach it on the first try. In return, everything else on this level is easy to do. Just as SF1, again, only this time we've added two more collapsing floor pieces. A nice speed boost when dropping in to the quarterpipe sets the tone for this level. I got some good speed on the first rail and managed to preserve some of that for the second rail as well. In conclusion, this run turned out to be more frustrating and time-consuming than I had thought, but hard work always pays off and this was no exception. Thanks to J.Y for support, thanks to SDA for being the #1 speedrunning community out there and thank you for watching this run. Let's Scoot!